and local hosting meets your security needs. As business processes have got a significant facelift because of technologies in recent times, the methods of data have also experienced the impact. Home-based startups are serving the clients all over the world, and larger enterprises are looking to grow their reach to every home. These rapidly changing business practices have raised the bar for data associated with it. Cloud for its amazing benefits comes as an inevitable option for the accounting and data management. However, some professional doubt the security over the cloud-based solutions. 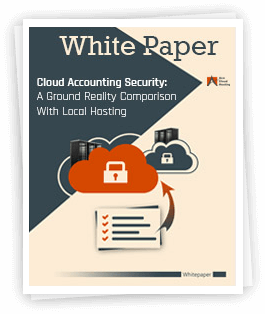 This whitepaper details comparison of security aspects between cloud accounting solutions and local hosting solutions. All the comparisons and security details mentioned in the whitepaper are focused on the perspective of the CPA and other accounting professionals. Along with the comparison, we have listed the steps that you can adopt to maintain the security of the accounting data and applications without any compromise with the performance.